Some friends in Denver have put together this video about Ben Salmon. Give it a listen and learn about an American Catholic family man and conscientious objector who lived during World War I. This entry was posted in Conscientious Objection, Documentaries and Film, Just War, Militarism and Christianity on March 23, 2019 by Cammy. Maybe this should be “examining the role that churches play in propagating war”? This panel discussion will examine the role that faith plays in times of war. Beginning the conversation with the rise of the chaplain corps during the First World War, a group of academics, religious, and current duty military will speak about the importance for caring for the spiritual well being of soldiers in the face of the horrors of war. This entry was posted in Events, Militarism and Christianity on December 17, 2018 by Cammy. Either this kind of thing is Christian, or it’s not. This entry was posted in Militarism and Christianity on December 3, 2018 by Cammy. Because of Roseanne Barr’s recent tweet about Valerie Jarrett, Retroplex is running the original Planet of the Apes series of movies. Taking a break last night I saw Beneath the Planet of the Apes (1970). Although the cable guide gives it 2 out of 4 stars, it was definitely more a 3. Without revealing too many spoilers, among a lot of great anti-war themes was a hilarious parody of Peace-Through-Strength conservatives. In the 40th century, there is a Church of the Alpha-Omega Doomsday Bomb located in what was once St. Patrick’s Cathedral in New York City (before there was a nuclear holocaust). As can be seen in the short clip below, the symbolism of the bomb replaces that of the cross all over the church. This entry was posted in Documentaries and Film, Militarism and Christianity, Military Culture (of Death) on June 6, 2018 by Cammy. This is an excellent historical overview of American Catholicism and the last 100 years with respect to war, a pro-life issue. On April 6, 1917 the United States House of Representatives voted in favor of President Wilson’s war resolution and the U.S. entered WWI. On April 18, while meeting as the trustees of Catholic University (CU), two Cardinals and six Archbishops signed a letter which was delivered to Wilson by James Cardinal Gibbons. In the most effusively patriotic language possible, it promised all out support of U.S. Catholics for Wilson and the war. That promise was kept. Three cardinals, including Gibbons, set up a general “Convention” of Catholics which took place at CU on August 11-12. “There were present official representatives, clerical and lay, from sixty-eight dioceses…twenty-seven national Catholic organizations and also of the entire Catholic press…In November, the Archbishops of the United States constituted themselves the National Catholic War Council. “ (Handbook of the NCWC, pages 8,10) The NCWC is considered the predecessor of today’s United States Conference of Catholic Bishops (USCCB), making 2017 its centenary year. This entry was posted in Just War, Militarism and Christianity on December 18, 2017 by Cammy. See the video below of the magnificent Mass and ceremony that took place in San Francisco on October 7. Witness the consecration of the Archdiocese to the Immaculate Heart of Mary! Archbishop Cordileone tells us in his homily that the “century through which we have just passed was nothing other than an experience of hell.” 100 years of wars, genocides, moral depravity and blasphemy. And then he tells us what we must do in order to have hope that the next century might be “radically different,” so that the twin goals of Fatima might be realized, the goals of world peace and saving souls. He issues a “call to spiritual arms” as an antidote to the mocking of God which only leads to self-destruction. Archbishop Cordileone asks Catholics to honor Our Lady’s Fatima requests by praying the Rosary, and practicing penance and adoration. Please help spread the word to every diocese in the U.S.
And please remember how this evil century (“a living reflection of hell”) began. In 1917, the ongoing slaughter of WWI provoked communist revolution in Russia, the United States entered the war on the side of the Allies, and U.S. Catholic leaders tragically engineered the widespread capitulation of American Catholicism to the false god of American militarism. Can the next 100 years be different? This entry was posted in Militarism and Christianity, Perversion and Propaganda, War and Peace and tagged abortion, propaganda, violence, world war I on October 20, 2017 by Doug Fuda. On Saturday, October 7, 2017, the designated worldwide Feast Day of Our Lady of the Rosary in the Roman Catholic Church, I happened into one of these anti-Gospel proclamation niches. Attending Mass that day I heard the priest in the pulpit fill the minds of the Christians in the congregation with a mishmash of historical facts, embedded Catholic fables and outright theological untruth, the purpose of which was to promulgate the idea that God and Mary were on the Catholic side, supporting the Catholic killers in a homicidal political-economic-religious naval battle against Islam i.e. the Battle of Lapanto on October 7, 1571. The priest began by stating the historical fact that Pope Saint Pius V sent and blessed the Holy League Navy, the Catholic Navy, which included the Papal Navy, out to destroy the Muslim navy in the Gulf of Lapanto. Although greatly outnumbered he said, (the actual number was 280 ships to 212) the Catholics won the battle, which Pope Saint Pius V attributed to the Rosary being prayed in Rome for a victory. Pope Saint Pius V—who before becoming Pope had worked himself up to being the Inquisitor General of the Roman Catholic Church—declared October 7 to be the Feast Day of Our Lady of Victories because of her part in bringing a homicidal victory to the Catholic Holy League. After his death the next Pope changed the name of the feast to Our Lady of the Rosary, which it remains to this day. However the change of name did not change the message that the leaders of the Church—to this very day—universally communicate to Catholics about the meaning of the feast, namely, prayers to Mary, especially the Rosary, can procured a victory by homicidal violence over an enemy. And by simple logical extension, praying to Mary can obtain a violent victory over the enemies of Poland, France, Italy, Russia, the United States, etc. Yet, the official teaching of the Church which is never mentioned in such homilies is “While the characteristics of the shalom of the Old Testament are present in the New Testament tradition, all discussion of war and peace in the New Testament must be seen within the context of the unique revelation of God that is Jesus Christ and of the reign of God which Jesus proclaimed and inaugurated. There is no notion of God who will lead the people in an historical victory over its enemies in the New Testament.” (The Challenge of Peace: A Pastoral Letter on War and Peace, United States Conference of Catholic Bishops, 1983, §39, 40). There is not a speck of violence and/or enmity in Mary in Gospels. Mary is an explicit witness to the truth that Jesus proclaims. Her last public words in the Gospels are, “Do whatever He tells you.” There cannot be an inkling of dissonance between the what the Mary of the Gospels sees and teaches as the will of God and what the Jesus of the Gospels sees and teaches as the will of God—and Jesus sees and teaches by word and deed a Way of Nonviolent Love of friends and enemies as the Will and Way of God. Mary is not God. She can only intercede with God through her Son, Jesus, who is the Incarnation of God. It is absurdity in the extreme to teach that the Nonviolent Mary of the Gospels will intercede with her Nonviolent Son of the Gospels to help one partisan homicidal groups kill and maim more human beings than another homicidal group that it calls “the enemy,” and thereby win a glorious homicidal and “historical victory over its enemies.” Such an understanding of Jesus and Mary and their relationship to each other and to each and every son and daughter of the “Father of all” is loathsome and revolting. The fact that the rulers of the various Churches in every nation and in every ethnic group permit, and indeed foster, around the globe in the lives of ordinary Christians such a monstrous belief about Mary deserves universal publicity and universal condemnation from the top down and from the bottom up. If there is to be a Feast of Our Lady of the Rosary, and I think there should be, remove it from the October 7th date, where it can be and is subverted into a piece of Marian military jingoism. Place it on a date where only the Christlike holiness, peace, love, trust and universal compassion—of the Mother of a Son murdered by state and religious rulers and the Mother of a Son Resurrected in love, by love and for love—shine forth the truth and glory of God. Failure to take this definitive step of totally separating the Marian Feast of Our Lady of the Rosary from October 7 and the Battle of Lapanto will for certain result in solidifying the status quo. The Nonviolent Mother of the Nonviolent Jesus will continue worldwide to be invoked, not to help one love his or her enemies as Jesus loved His enemies, but rather to help one kill his or her enemies more efficiently than his or her enemies can kill. Bishops, priests, ministers and religious educators will continue to propagate, Mary Slayer of Muslim, e.g. in pre-school to adult pious books, magazines, sermons, Catholic art, Church windows, etc. And, as happened in the little niche of Christianity I was in on October 7, 2017, the relation will be drawn between invoking Mary for a victory at the Battle of Lapanto—which the priest erroneously claimed saved the Church—and fighting ISIS today! 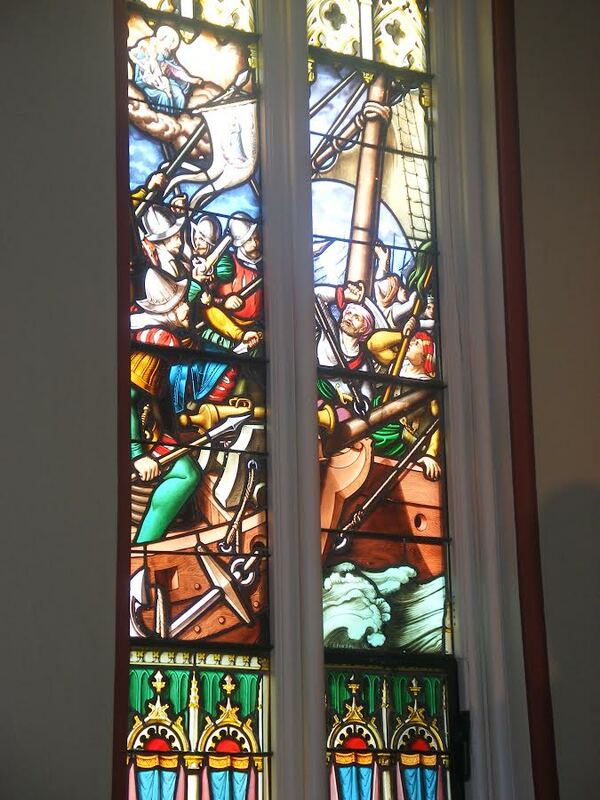 Here is an example of one of the tens of thousands of Catholic niches glorifying the Battle of Lapanto and Mary Slayer of Muslim. This is a stained glass window immediately to the right of the main alter at the Papal designated Basilica of the Sacred Heart on the campus of the University of Notre Dame. Mary with the Baby Jesus presides over the Battle of Lapant in the upper left corner. This entry was posted in Militarism and Christianity, Perversion and Propaganda, Speeches and Sermons and tagged Battle of Lepanto, Catholic, ISIS, Mary, Muslim, October 7 on October 10, 2017 by Cammy.